Summer is almost gone and we have some dynamite memories of the East Village Association barbecue. Thank you to all of those who helped and those who came to enjoy. This type of neighborhood togetherness is part of what EVA is all about. Some of the interesting neighbors that I met are Adele and her daughter, Mary. Their history in the East Village started the summer of 1967, a number of years before EVA was formed. Adele moved to Augusta Avenue with her three children and found a very comfortable Polish neighborhood where she could raise her children. Mary went to Andersen School and became part of the "neighborhood kids" on Honore Street. There were many families on that block, each with 3 to 5 children. The kids would take over the street after school for a game of Frisbee, football or other seasonal sports. This same kind of grouping was present on Marshfield between Thomas and Haddon. So if you didn’t like the game on your street, you could walk a couple of blocks and join in the fun with another group. The neighborhood was dominated with first and second generation Polish families. Kids spoke some Polish at home for the parent’s generation and then less as the generations progressed. The families attended St. Boniface Church, which further bonded these families. There were summer picnics, dances and a bazaar. After St. Boniface was closed, they attended Hoyne Avenue Wesleyan Church, 2108 W. Iowa. 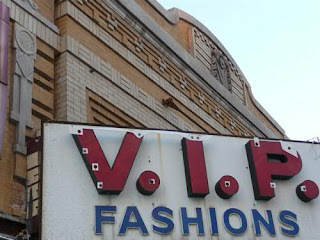 They attended movies at the Crown Theater (now the Chopin, 1543 W. Division St.), the Royal Theater on Milwaukee near the Burger King, the Alvin Theater (now VIP Fashions) across from Goldblatt’s at 1614 W. Chicago Ave., and the Hub Theater, 1744 W. Chicago Ave. near Wood Street. This provided great inexpensive, local entertainment for both parents and the kids. The Alliance Bakery (still in business under the same name at 1736 W. Division St.) provided Polish specialties since it was owned and operated by a Polish baker. Polish taverns on Division Street were as popular as the restaurants are today. Mary remembers the Putt-Putt that was owned and operated by a neighbor about a block away. It was a motorized wagon with a 6 by 6 foot hut that traveled the neighborhood selling terrific hot dogs and tamales. Mary also remembers the Polish parade that started at the Polish National Alliance, 984 N. Milwaukee Ave. at Augusta, and ran along Augusta to Humboldt Park. Mary had her own outfit for the parade with ribbons and a head dress. Later in the year was Trick or Treat, when she and her friends could visit each house. Growing up in this neighborhood, the families always felt safe and the adults were comfortable letting their kids play at neighbors a couple of blocks away. Adele worked at the U.S. Environmental Protection Agency for many years and ultimately retired from there. She typically took the subway to her Loop office and remembers the challenges of getting around during the blizzard of ’67  so much snow that people were forced to walk in the streets and most of the schools and businesses were down by 50 percent in attendance and customers. Adele likes to sing and she took voice lessons locally while singing in the church choir. She also participated in a choir performance in Grant Park, was a member of the Polish Catholic Choir Society that traveled around the city performing at different events and even performed a solo on a Polish program on local TV. Adele and her family have seen this neighborhood evolve through two major transformations. As the Polish families grew up and moved out of the neighborhood, many were replaced with Latino families that brought a new language and new customs. Many joined the same church, went to the same schools and played in the same streets. Somehow, there was not the same togetherness as when Adele was younger and when her kids were at the same age. More recently, Adele has seen a second transformation, as the neighborhood is restored and rebuilt to support the influx of a younger generation. Adele is pleased with many of these changes and sees most of them as improvements. The new residents bring with them a different cultural lifestyle that has not established the neighborhood togetherness that Adele once knew. Adele is reaching out to community groups like EVA to help establish a closer community spirit for her neighborhood. This is an open invitation to come join us at the Sept. 2 EVA meeting and meet Adele and her daughter Mary. You can use this opportunity to learn some more about the history of the East Village and share some of your experiences with Adele.